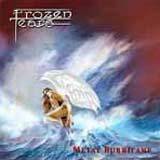 Here is the third album from Italian metallers, Frozen Tears. The band makes no secret about the fact that their music is influenced by Judas Priest. Of course, this is a risky undertaking. When a band closely tailors its sound closely to one band (and freely admits it), listeners will inevitably compare the final product to that of the Gods of the genre. If the band (in this case, Frozen Tears) does not stack up, criticism will be plentiful. Cage is an example of a band that has been able to map its sound after a legend, but with enough twists and quality to make it very worthwhile. Even if not subject to criticism based on merits, the "originality police" will certainly be out in full force to chastise the band's lack of originality. As you can see, Frozen Tears have made a gutsy move to model their sound after a legend such as Judas Priest. The end result is a mixed bag for me. What can I say? I like Judas Priest and Priest influenced traditional metal. On some levels, the band captures that spirit and sound. Of course I'm going to like some of what's going on here. The basis of the band's sound is strong guitar work. You'll hear numerous flamboyant guitar solos and crunchy, yet catchy riffs that sit somewhere between the might Priest and Accept dominating the songs. Shredding is generously spread throughout the album, although I wish the guys would have used some more duel guitar shreds and rhythms (ala Rebel Souls) too. The drumming is speedy and frantic, with a nice helping of cymbal crashes to add emphasis to the songs in the right places. Overall, the sound is very "full" with the bassist putting forth a strong effort on the low end. After the album comes to a close, I am hard pressed to identify any standout songs. I can't say that there are any "duds" on this album, but I wouldn't consider any of these songs killers. Although consistent, Metal Hurricane features songs that consistently fall in the slightly above average to good range. Once the album is finished, I don't feel the need to start the album again from the beginning. From a musical standpoint, the band is very talented and they don't make any mistakes, but the songs lack that special something that demand repeated listens. For me, the weakest point of this album is the lead vocalist. His delivery is similar to that of Rob Halford, however he does try to create his own sound. Instead of using clean, soaring vocals, Alessio Taiti tries wayyyyyyy too hard to add a harsh, aggressive quality to his voice. I think this sounds extremely unnatural and forced. If only he would relax a little and just let the notes come out, I think he would sound great. Additionally, I think his voice would blend with the music at hand much better without the attempts to use a harsh delivery. In several spots, Taiti goes for the siren like shriek, an obvious nod to Halford. Again, when patterning a style after such a prolific figure in metal, comparisons are inevitable. Taiti does not possess the range or power of Halford, as his shrieks sounds very strained. I'll say it again; if Alessio Taiti can just relax a little, be himself, and use his voice more effectively, he will be a great asset to this band. Metal Hurricane will certainly appeal to fans of traditional metal fans to some degree, especially those waiting for the new Judas Priest album to come out. Given the somewhat standard songwriting and the less than spectacular vocals, I'm not quite sold on this album. However, the musical talent within this band is such that I cannot turn a blind eye to these guys. I am curious to see how the guys develop their sound in the future. Will they grow as songwriters? Will the vocalist not try so hard to be something / someone that he is not? If the band answers these questions "Yes" with their future work, I am sure the result will be quite pleasing to hear!